Welcome to the residents municipal services page. If you are looking for specific municipal service information, this is where you will find it. Simply use the tabs below and to the left in order to select a service from the menu. The Town of Cobalt is committed to ensuring equal access and equal participation opportunities for people with disabilities. We are committed to treating people with disabilities in a way that allows them to maintain their dignity and independence. We believe in full participation and we are committed to meeting the needs of people with disabilities in a timely manner. We will do so by removing and preventing barriers to accessibility and meeting our accessibility requirements under the Accessibility for Ontarians with Disabilities Act and Ontario’s accessibility laws. Access the Town of Cobalt’s Accessibility Plan. Please click here to download a copy of the current plan. Dog and cat tags are available at the Paul Penna Public Library or from the Animal Control Officer. Tags must be purchased each year. Contact Animal Control Officer Garett Hunting (705) 672-3985 with any issues or concerns. Access the Town of Cobalt’s Asset Management Plan. Please click here to download a copy of the 2014 Town of Cobalt Asset Management Plan. Building permits are for the safety of the home owner and any future home owners of the property and provide information to MPAC in order to keep property assessments current. The building department services for the Town of Cobalt are contracted to the Temiskaming Municipal Services Association (TMSA). The TMSA is comprised of twenty one member municipalities in the Temiskaming district of Ontario. Services include the permitting process, building inspections, and building code enforcement. To get in touch with the TMSA, please contact the Township of Armstrong at (705) 563-2375. Building permits must be obtained before you start work on a new construction or demolition project. Although a permit may not be required, all zoning requirements still need to be followed. The Cobalt Volunteer Fire Department contributes a great deal to the community. These individuals are always there to lend a helping hand or to organize community events. Their barbecues are second to none (and they are safe!!) and the treats they put together at Halloween are special. The Haunted House, Santa Skate, fundraising all contribute to making our community so special. The Public Works Department is responsible for all roadways, sidewalks, public buildings, parks, snow removal, water distribution and safety as well as wastewater treatment. This represents most of their responsibilities but they do much more. Their efforts to maintain our community and provide a safe environment for its citizens requires everyone’s cooperation. Please obey parking regulations and comply with municipal bylaws. The Town of Cobalt boasts superior quality drinking water drawn from Lake Sasaginaga which has been protected since 1917 through an Act of the Provincial Legislature “The Cobalt Municipal Water Act”. This lake provides all of the drinking water for the municipality and some residents of Coleman Township. No development has been allowed on the watershed flowing into the lake, nor is any kind of building or recreation allowed on it or the lakes feeding directly into it. This is one of very few lakes in Canada which has been totally protected from development thus ensuring a safe drinking water supply in perpetuity. It stands as a testament to the foresight of the mining companies and the municipality. Recreation is an essential part of human life and finds many different forms which are shaped naturally by individual interests but also by the surrounding social construction. Leisurely activities can be found throughout the Town of Cobalt. Facilities that hold these recreational activities are displayed below. 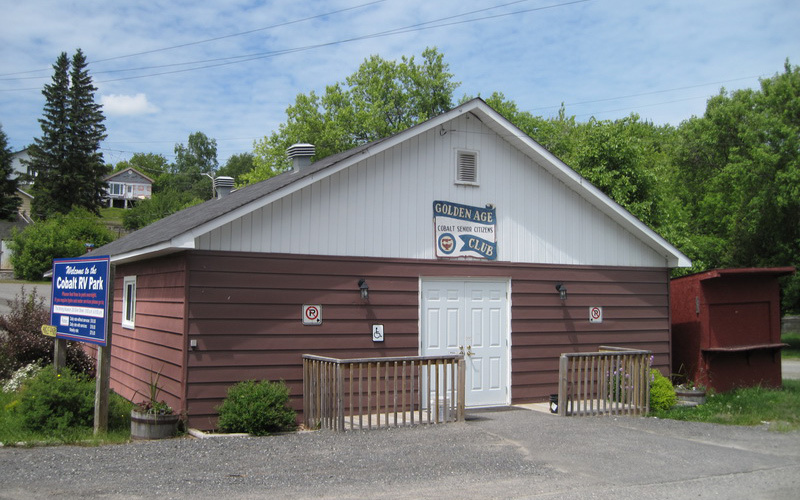 The community hall is situated in downtown Cobalt above the municipal office and can accommodate groups of 180. Although it is upstairs, there is an electric chair lift which provides secure accessibility to the upper floor. The hall is equipped with a bar facility and an exceptional kitchen where meals can actually be prepared. The dishwasher is commercial grade and there are sufficient place settings for large groups. The Golden Age Club offers a variety of opportunities for local age 50+ Senior residents to visit and socialize. The club hosts a monthly membership luncheon followed by its monthly meetings. The members enjoy various activities planned with seniors in mind. The club exists to provide for an exchange of ideas, through formal meetings or informal gatherings. We are basically a social club that organizes activities that enhance the physical and mental well-being of our members. All persons over the age of 50 are welcome to join and be part of the activities and meetings. The club is open not only to Cobalt residents, but also to those who reside in the outlying areas. The Cobalt Hoist Room is a fully equipped and functional weight training and exercise facility. It boasts a complete set of free weights from 5lb to 110lbs and a large quantity of plates for benches and bars. There is a good variety of work stations including a new abdominal crunch, leg extension, shoulder and bench press, lateral pull down and more. Three commercial treadmills and a recumbent bike compliment your routine. Located in the Father Costello Arena, the facility is operated by a keyless entry security card system with security cameras so everyone is free to work out on their own schedule. Our facility is the best value for your fitness dollar in Temiskaming. Applications must be completed in person at the Town Office and require photo identification. The Teck Prospect Park has been developed through a generous donation from Teck Corporation in honour of Dr. Norman B. Keevil’s contribution to Canadian Mining and Cobalt’s mining legacy. The park is fun for the whole family. Visitors can enjoy a beautiful green space that includes two soccer fields, the Ken Buffam Memorial Baseball Field, and a splash pad. 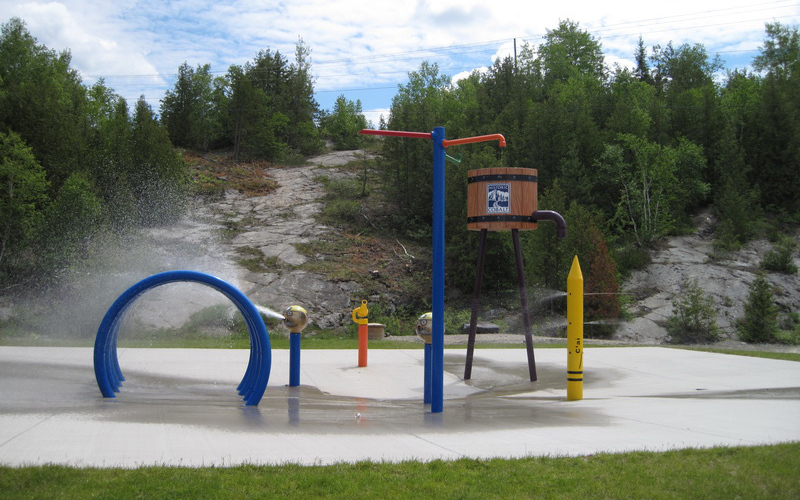 The Teck Cominco Splash Pad opens at 10AM and closes at 8PM daily. The seasonal operation typically runs from June to Labour Day, weather permitting. The area is surrounded by beautiful Cobalt Lake and the Keevil Walking Trail. The children’s playground area rounds out this family oriented facility. The ball park and soccer field can be reserved and rented by calling the Town of Cobalt municipal office. A complex, and sometimes confusing system, property taxes provide municipalities with the dollars they need to deliver the programs and services residents depend on each day. The property tax system is based on the age-old practice of collecting taxes based on property values. Here’s how it works. The process begins by determining each property’s assessed value. The Municipal Property Assessment Corporation (MPAC) does this for the entire province of Ontario. Each property is assessed at its market value. The same house could have two totally different market values in two different towns. Property values are then supplied to municipalities on annual assessment rolls. Municipalities complete the process by applying the appropriate tax rate to the assessed value of the property. Tax rates are determined annually in each municipality, and differ between the various tax classes (i.e. residential, industrial, commercial, etc.). Even though municipalities collect taxes on behalf of the Province, they only keep one portion for themselves. Some of your taxes are used directly for community programs and some are put aside for the Province either for education or for provincially mandated programs such as welfare, social assistance and affordable housing. If you have any questions about your municipal property taxes, please contact the Town of Cobalt at (705) 679-8877 or email cobalt@cobalt.ca. Property taxes are calculated by multiplying the assessed value of the property by the applicable tax rate for the specific tax class. Below is an example of a tax calculation. In addition, special area charges for specific services may apply. Other charge such as policing is charged separately and added to the tax bill ($ 595.00) These are evenly distributed throughout the municipality. Water and sewer capital and operating are charged $232.26 quarterly per residential unit. This will vary for multi-unit dwellings. Please note that, if applicable, other charges such as local improvements, municipal drains or business area improvement charges might be added to your tax bills. These would be determined by Council through the budget process. The Town of Cobalt has introduced an automated garbage and “single stream” recycling system. This means that you can put all of your recyclable materials into one bin, making it easier to recycle and less garbage will end up in the landfill. This new system will also help save taxpayer dollars and the environment. Recyclables placed in non-approved containers will not be collected. Please do not use cardboard boxes or grocery bags as containers. Do not bag your mixed recyclables in plastic bags (i.e. garbage or grocery bags). Place items loosely in your recycle bin, with the exception of shredded paper which requires packaging in a clear plastic bag. Aluminium cans, trays, burner liners, pie plates, roasting pans, etc. Plastic outer wrap from packages, such as from paper towels, cases of water, etc. Newspapers, flyers, telephone directories, magazines, catalogues, books (hardcover removed), etc. Medical waste: needles are hazardous waste (Must not be put in garbage; take to annual Orange Drop event). Glass – drinking glasses, dishes, cups, crystal, window glass, light bulbs, mirrors, pottery, etc. Metal – scrap metal, coat hangers, pots, pans, etc. Wood – pieces, flooring, crates for fruit, etc. Yard Waste – grass clippings, tree limbs, leaves, etc. Garbage placed in non-approved containers will not be collected. Please do not use cardboard boxes or grocery bags as containers. Winter weather conditions create challenges for the collection of waste. During extreme weather conditions, your garbage and recycling collection may be delayed; however, Phippen Waste Management will do their best to ensure regular collection schedules remain on time. During the winter months, it may be necessary to change the regular placement of your rollout bins after a snowfall. To view or print an information sheet regarding Curbside Waste Collection during Winter Months, please click here. Place your garbage or recycling bin at the curb between 8:00 p.m. the evening before and 6:30 a.m. on your collection day, as pick-up times may vary occasionally without notice. Place your garbage or recyclable bin in a visible location as close as possible to the roadway, but not on a travelled roadway, or in an area that would interfere with pedestrian/ vehicular traffic, mail delivery vehicles, or maintenance operations. The front-side of the bin must face the street and the immediate space around the bin must remain unobstructed (at least three (3) feet from an object for the mechanical lift arm used in automated collection). If you wish, you may clear a spot for your recycle and garbage bin that is free of snow and easy for collectors to see. Do not place any of your containers on top of or behind snow banks. It is important to keep a safe distance between you and the waste collection truck. Whether you are driving or walking near a truck, always stay alert and please do not approach the vehicle or the automated side arm. Store it so it can be picked up during the next collection period. Dispose of your garbage at the City of Temiskaming Shores landfill site on Dump Road. Bring your own bags when you shop. Garbage and recycling collection occurs on the same as your existing pick-up, but on alternating weeks. Please refer to the Curbside Collection Schedule below for your scheduled day. For animal resistance, consider keeping your garbage containers inside a garage or a shed, and place your garbage at the curb or roadside by 6:30 a.m. on your collection day, not the previous evening. If you are unable to place the containers inside, regularly wash to help reduce odours. The hard plastic cover on the bins prevents dogs and other animals from opening and reaching the contents. The Town of Cobalt currently partners with the City of Temiskaming Shores for use of the Haileybury Landfill. If a Statutory Holiday falls on a Monday, the next day Tuesday will be recognized as the Statutory Holiday and the landfill will be closed. Be courteous and allow sufficient time to unload garbage prior to closing time of 4:30 p.m. Please do not show up at 4:20 p.m. with a large load. Orange Drop is a recycling program aimed at keeping hazardous and special waste materials out of Ontario’s landfills and waterways. The Orange Drop program allows residents to return designated materials to a Household Hazardous Waste (HHW) collection event. For more information on what you can drop, go to www.makethedrop.ca. Commercial hazardous or special waste is NOT accepted. Do I own the garbage and recycling bins? No. The bins will belong to the property, not the homeowners. Can residential property owners opt out of the enhanced waste management program? No. It is the intention of the Town of Cobalt to have all of its residents participate in the program, to ensure that all appropriate material is being diverted from our landfill. This increased diversion rate will extend the life of the landfill. I am a property owner with renters. What does this mean for me? You are responsible for ensuring the bins are available for your tenants. Are the bins durable and easy to manoeuvre? The garbage and recyclables bin are flexible and are proven to hold their shape even after years of service. The bins are constructed to withstand an automated collection system and are easy to roll even with heavy loads. The reinforced top lip adds strength and rigidity as do the double drag rail and reinforced bottom. The specially designed wide ground-hugging base helps keep these carts upright and stable. When will garbage and recyclable material be collected? Collection will be conducted Thursdays, on a bi-weekly basis. Do I bag my recyclables? No. Any items received at the sorting facility in garbage or grocery bags are considered non-recyclable materials, as these bags are not opened and the contents are not sorted. Exception: Shredded paper. Place and tie shredded paper in a clear plastic bag. Are black or green garbage bags required to hold garbage in the bin? No. You have the option of placing your garbage in a regular sized garbage bag and then into the bin, or you can put smaller, “kitchen catcher” bags of garbage into the bin, eliminating the need to continually purchase large garbage bags. What if I don’t produce enough waste to fill the garbage or recycling bin every two weeks? You have the option of waiting until your garbage or recycling bin is full before setting it out for collection. What if I have too much waste to fit into the bin(s)? Cut up or breakdown oversize items. Dispose of your garbage at the Town of Cobalt landfill site. Proper disposal of items like propane tanks, batteries, pesticides, oil, fluorescent tubes, compact fluorescent light bulbs, etc. means taking these items to the annual Orange Drop Event. These types of items must never be put in recycling or garbage. For more information on the type of materials accepted, please visit www.makethedrop.ca. Yes, we recycle ALL plastics No. 1-7. Please rinse out all food containers, and empty liquids from beverage bottles. Yes. The program will accept styrofoam; please ensure to remove the absorbent pad from styrofoam meat trays. Should I empty out bottles and cans? Yes. Please pour out leftover liquid from bottles and cans, and rinse food from containers, especially from nut butter, mayonnaise and sauce containers. Should I remove the lid from my plastic bottle? No. The plastic lid is recyclable. Do cardboard boxes need to be flattened? Yes. Please flatten cardboard boxes and empty all packing materials, such as plastic bags and foam. Yes. Clean pizza boxes are recyclable as long as the leftovers and wax paper liner are thrown away. Yes. Please bag shredded material in a clear plastic bag and place it in the recycling bin. Are paper towels, tissues, and napkins recyclable? No. These items are considered to be used / soiled and are not accepted at the Material Recovery Facility. Yes. We recycle all books; however, please separate cover from hardcover books. Yes. Sheets of aluminum foil are recyclable along with other aluminum containers, such as pie pans and lids from some carry-out restaurants. Please rinse off all food prior to placing in bin. Greasy and or food-laden aluminum trays from grills or other cooking are not acceptable. Please put aluminum contaminated with grease and/or food in the trash. Can electronics go in the recycling bin for curbside pickup? Where do I call for additional information? Please contact the town office at (705) 679-8877. Council Resolution 15-064 eliminated the Annual Spring Clean-Up Program and implemented an Amnesty Program (no Tipping Fees) which will consist of a week in the spring and one in the fall with some restrictions (see below) at the Haileybury Landfill Site. Spring Amnesty Week: Tuesday, May 17 to Saturday, May 21, 2016 from 8:30 a.m. to 4:30 p.m. Surcharge fee of $60 remains applicable for Metals/Bulky Waste containing Freon gas.